Tuch were commissioned by Royal Mint Museum to develop their first website following their accreditation. The site will eventually allow their entire collection to be searched and viewed online. The project required a lengthy period of research and development to find a solution which could securely host the museum’s material, from interactive timelines to online exhibitions as well as academic articles and family learning pages. The design had to work for the museum and also sit alongside the Royal Mint’s corporate and e-comerce site, with links between the two. 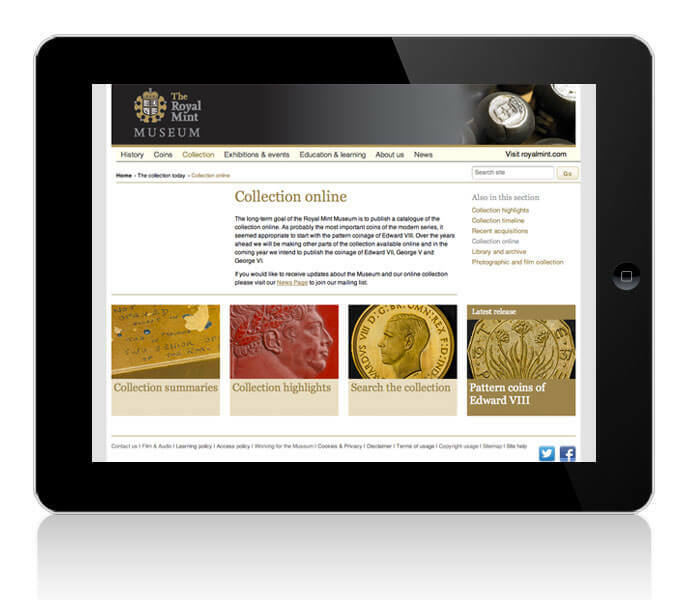 In March 2014 the first batch of the Royal Mint Museum's unique collection went live - ready to be searched and viewed online. This is the first step towards making the whole collection accessible, using Modes collection management software. The project began in 2011 when Tuch were commissioned by the Museum to design and build its website. The project required a lengthy period of research and development to find a solution which could securely host the museum’s material, from interactive timelines to online exhibitions as well as academic articles and family learning pages. The design had to work for the museum and also sit alongside the Royal Mint’s corporate and e-commerce site, with links between the two. The Royal Mint Museum looks after one of the finest collections of coins and related material in the world. The collection is held at the Mint in south Wales in a secure manufacturing facility which limits the possibility of public access. The site is hosted and managed via Adobe BC, allowing Museum staff and volunteers to update pages and manage content. Webforms allow the staff to manage enquiries from the public, and build databases for marketing campaigns. Phase one of the site was posted live in January 2012, with additional educational material for London 2012 and the Diamond Jubilee added in the spring. The collection has now started to be made available online, and a strategy is being put in place for developing the website content and marketing. Staff have received trainning on simple updates and we have created custom video tutorials on how to add articles and images. We maintain the integrity and functionality of the site allowing the museum staff to gradually increase their skill levels to manage the day-to-day updates.